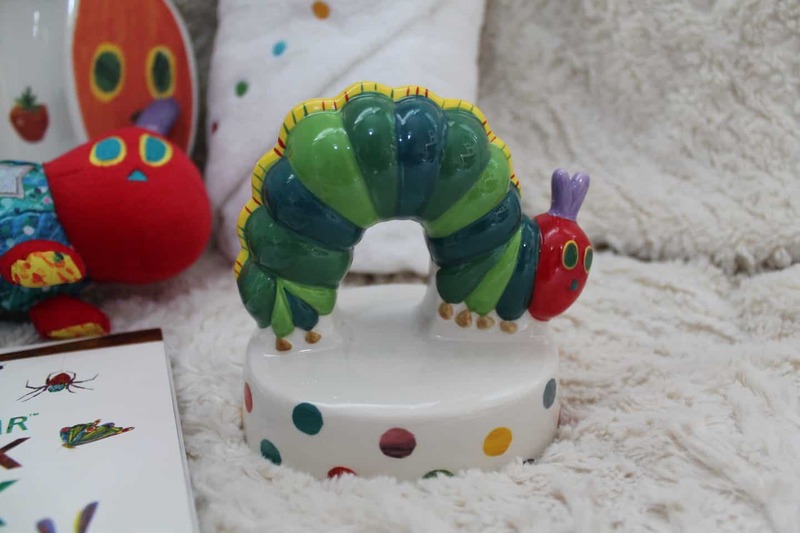 We are big The Hungry Caterpillar fans in this house, it’s a great way to teach little ones about the life cycle and of course it’s an iconic childhood figure that I remember from my own early years! 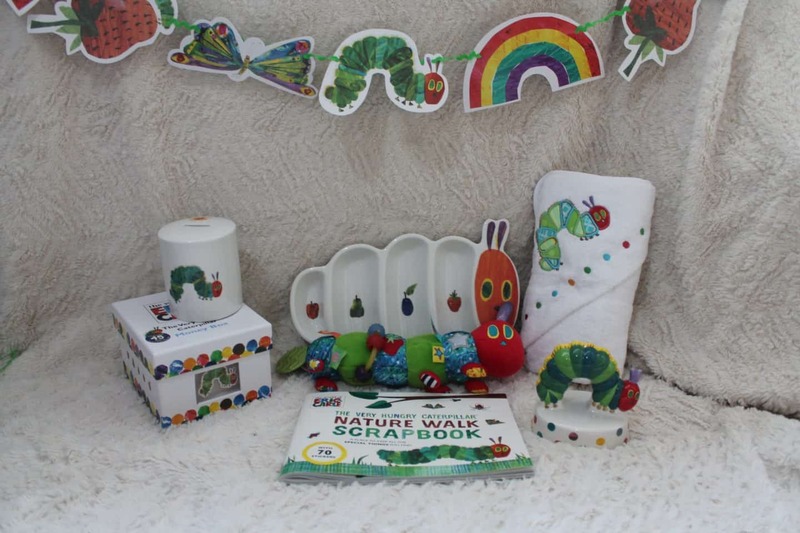 As well as the book there are all sorts of other items in The Hungry Caterpillar range, and my two were lucky enough to be sent a bundle of goodies, some of which I have kept back to open at Christmas, otherwise I’ll have some very spoilt kiddos on my hand! There was a lovely soft snuggly hooded towel (or a cuddle robe as it’s called!) perfect for wrapping up warm right out of the bath, and a soft changing mat for little bottom changes! The towel has a little hood making it easy to keep your little one snuggled up and the changing mat is wipe clean and durable with that ever iconic caterpillar on! Also in this range are some bedding sets. If you’re after a gift for a first birthday, christening or christmas gift then the collectables are a great place to start, the figurines and money boxes are perfect! Coming packaged in little boxes that could easily be repurposed into keepsake boxes for all those precious things you want to keep! Arlo is always trying to get his hands on his sisters money box so I’ve kept this one aside for a Christmas present for him! Also a great idea for new baby gifts is the range of toys, many of which can be attached to prams or cots, and have crinkly bits, squeaky bits and soft bits. They’re perfect sensory toys! For older ones then the activity books, colouring books and sticker books would be perfect! There are also Memory Card games and puzzles too. If you’re having a party then there is so much available to really get the theme going, bunting, plates (both paper and proper!) and lots more! We were sent the divided plate, which is a lovely porcelain dish with four sections and I’ve been using it for snacky teas, putting carrot sticks, hula hoops and dips etc on it. The kids LOVE it! The full range is available on Amazon here, there’s something for everyone I think! 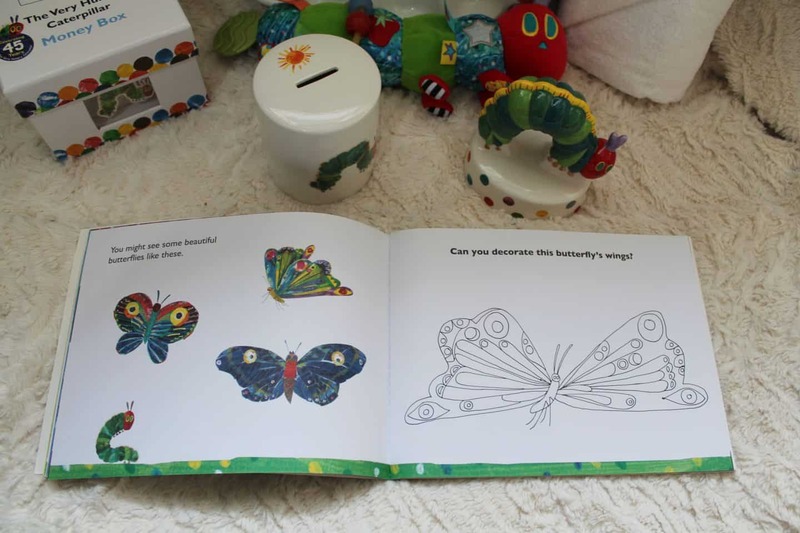 We were sent a bundle of The Very Hungry Caterpillar goodies for the purpose of this post, all words and opinions are my own.